U.S. stock futures are lower in pre-market trading for Monday, August 29. The Dow Futures are at 18372.0 for a loss of -8.00 points. The S&P 500 Futures are at 2167.75 for a loss of -0.75 points. The Nasdaq Futures are lower at 4783.75 for a loss of -2.00 points. The Russell Futures are lower at 1236.8 for a loss of -1.60 points. In overnight trading in the Eastern Hemisphere, Japan’s Nikkei 225 is at 16737.49 for a gain of 376.78 points or 2.30 percent. Hong Kong’s Hang Seng Index is at 22821.34 for a loss of -88.20 points or -0.38 percent. China’s Shanghai Composite is at 3070.03 for a loss of -0.28 points or -0.01 percent. India’s S&P BSE Sensex is at 27902.66 for a gain of 120.41 points or 0.43 percent. In Europe, the FTSE 100 is at 6838.05 for a gain of 21.15 points or 0.31 percent. Germany’s DAX is at 10503.42 for a loss of -84.35 points or -0.80 percent. France’s CAC 40 is at 4395.51 for a loss of -46.36 points or -1.04 percent. The Stoxx Europe 600 is at 341.98 for a loss of -1.74 points or -0.51 percent. Stock futures are pointing lower on Monday as the market digests a slightly more aggressive outlook for rate increases than was previously expected. Friday’s speech from Janet Yellen and subsequent comments from Fed officials noted that the Fed could potentially raise rates twice in 2016 if the data shows strong economic growth. Monday’s economic calendar includes a 3-month and 6-month bill auction from the Treasury as well as the Dallas Fed Manufacturing Survey. Also on the economic calendar will be Personal Income and Outlays, a key report for the Federal Reserve on inflation. Market trading for the week is likely to be flat ahead of Friday’s employment data report from the Bureau of Labor Statistics. The BLS will release its August Employment Situation report at 8:30 AM EST on Friday. The report will be a key indicator for the Federal Reserve and its upcoming policy decision on September 20 and 21 at its next meeting. Stocks were mostly lower on Friday. For the day the Dow Jones Industrial Average closed at 18395.40 for a loss of -53.01 points or -0.29 percent. The S&P 500 was also lower, closing at 2169.04 for a loss of -3.43 points or -0.16 percent. The Nasdaq Composite was higher for the day at 5218.92 for a gain of 6.71 points or 0.13 percent. 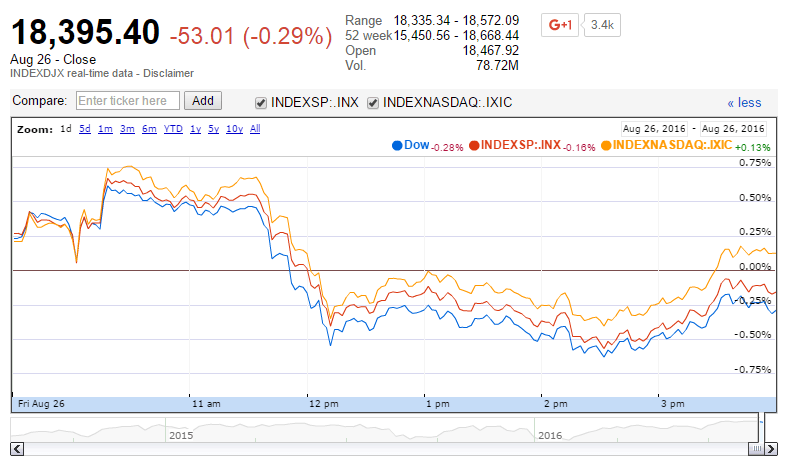 Source: DJIA, S&P 500 and Nasdaq Composite. Google Finance. Other notable index closes included the small-cap Russell 2000 Index, lower at 1238.03 for a loss of -1.97 points or -0.16 percent; the S&P 600 Small-Cap Index, lower at 751.91 for a loss of -2.10 points or -0.28 percent; the S&P 400 Mid-Cap Index at 1559.67 for a loss of -5.13 points or -0.33 percent; the S&P 100 Index at 959.06 for a loss of -0.75 points or -0.08 percent; the Russell 3000 Index at 1283.03 for a loss of -2.30 points or -0.18 percent; the Russell 1000 Index at 1201.74 for a loss of -2.17 points or -0.18 percent; and the Dow Jones U.S. Select Dividend Index at 614.39 for a loss of -5.20 points or -0.84 percent.